This morning the crew and I set out on a two-fold mission: to find a strong internet signal so I can blog and to eat some blue corn pancakes. Well, I get to eat the pancakes. Bridget and Spike get to stay in the Perfect Tow Vehicle and pretend they’re normal dogs. It’s almost nine o’clock as we motor down the road to Bluff. The Comb Ridge Cafe appears on the left. Mr. Coffee greets us at the parking lot. 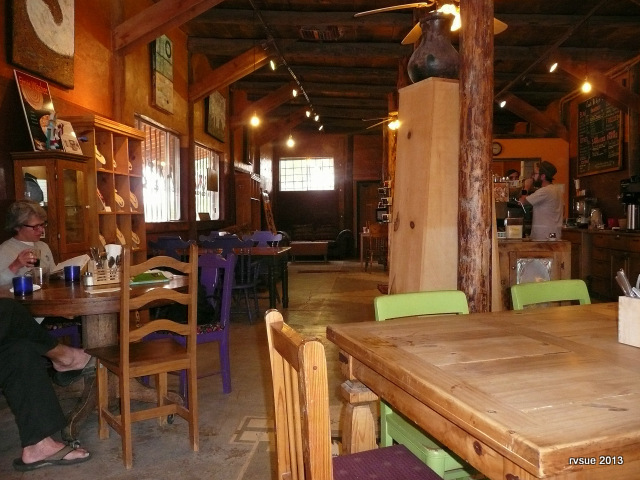 The atmosphere is comfortable and inviting. Art and jewelry are displayed. Hardly any wait at all and I’m pouring maple syrup over buttered blue pancakes. Delicious! Next I search for signal so I can blog. I drive through Bluff and up and down the highway, stopping whenever a strong signal appears on my air card. I attempt to load some photos and the signal fades. I drive somewhere else. Rinse and repeat. Back at Sand Island, I park the PTV so the crew and I can take a river walk. Bridget and Spike are happy to explore new ground. Spike eyes a nearby mud puddle. We wander around the day use area. 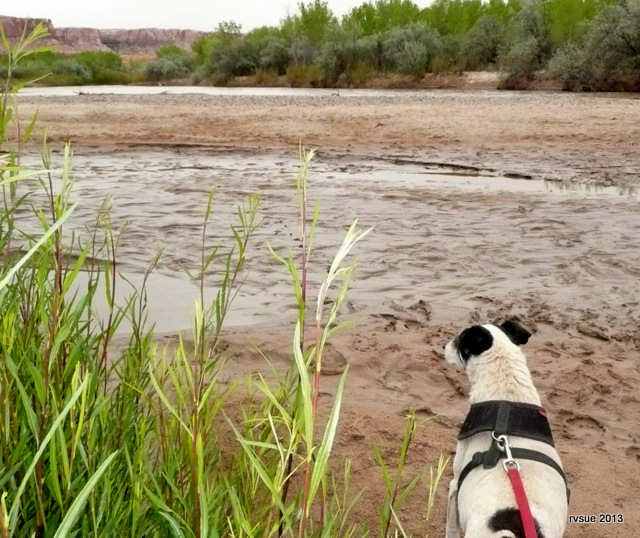 The San Juan River loves to meander. 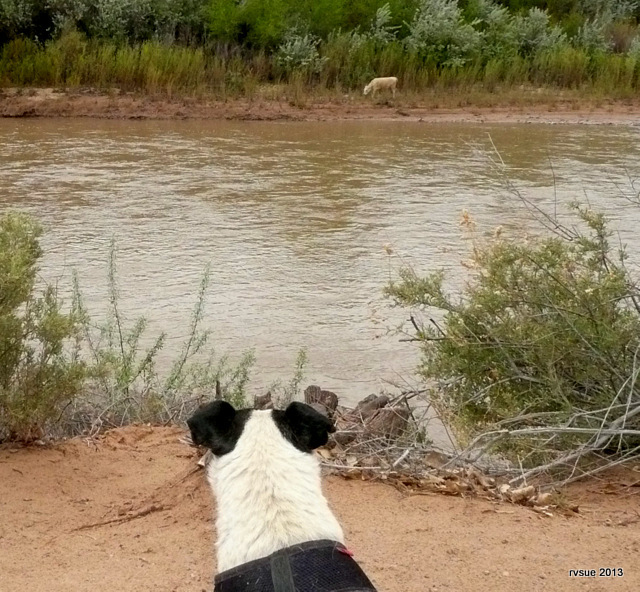 Ever-vigilant Spike warns a lone bovine to stay on the other side of the San Juan. People load rafts at the boat launch site in preparation for a 7-day float. The sky darkens. It looks like rain downstream for these floaters. On the way out of the boat area we come to the trash and recycling bins. I park the PTV and take care of that task. I’m feeling very good about life in general when I go to open the driver’s door to get back in the PTV. “Oh, NO!” The doors are locked (why and how, I don’t know) and the keys are inside! In fact the back-up keys are inside. And also, just for good measure, the Good Sam Emergency Road Service card is inside. Bridget and Spike commence barking. Gee, I couldn’t have planned it worse if I tried. Now what do I do? Not far from where we’re parked is the Ranger Office. I walk over there, explain the situation to Ranger Brit, and he comes out to the PTV with me. Just then a pick-up pulls up. It’s Jim from San Juan Shuttles, a float-trip company. And what does Jim have in his pick-up truck? If you don’t believe this, I don’t blame you, because I found it hard to believe myself, and I was there!. Ranger Brit sticks his head in the window of Jim’s pick-up and explains my predicament. Jim steps out of his truck carrying a kit for opening up locked doors! In a few minutes I’m in the driver’s seat, starting up the PTV. If you’re ever in Bluff, Utah, and want to float down the San Juan River, do me a favor and contact Jim and his wife, Pam, of San Juan Shuttles. They’re good people and apparently they believe in being prepared! 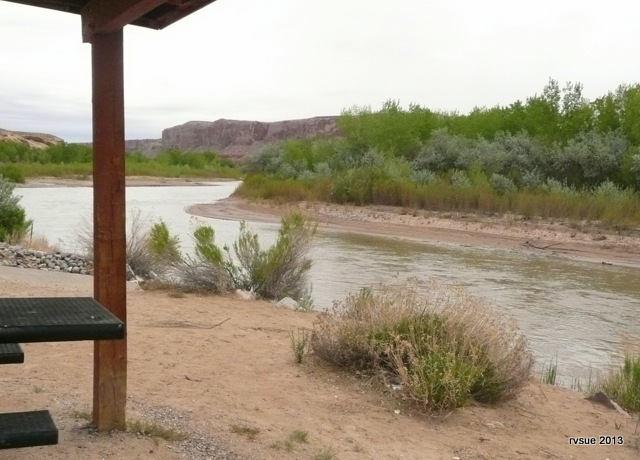 This entry was posted in Simple living and tagged floating, RVing, San Juan River, Sand Island, Utah. Bookmark the permalink. I guess from now on you’ll always have a spare key in your shoe. Obviously I need a plan! my car! Thanks Chris…. you have solved my challenge! Elizabeth in S.E. New Mexico…. How about a spare key “vault” that is magnetic and will strongly stick to a metal part, bumper maybe, of the van. It does need to be replaced every year or so as the magnets get weak, but then the multi-purpose duck tape can be used for another 6 months. Amazon does carry these things as well listed as “key hider auto”. Like so many of the places you have written about lately, I have gone through this area, but never stopped. I should more often. I’m sure you are on top of the weather, but just in case, you know that southern Utah is in for a few days of upper 90°s? Are you going up into the mountains? I don’t know what I’ll be doing beyond tomorrow. At the rate we’re going, there’s no way we’ll get out of Utah without some days in the nineties. I want to hang around Bluff a while longer. 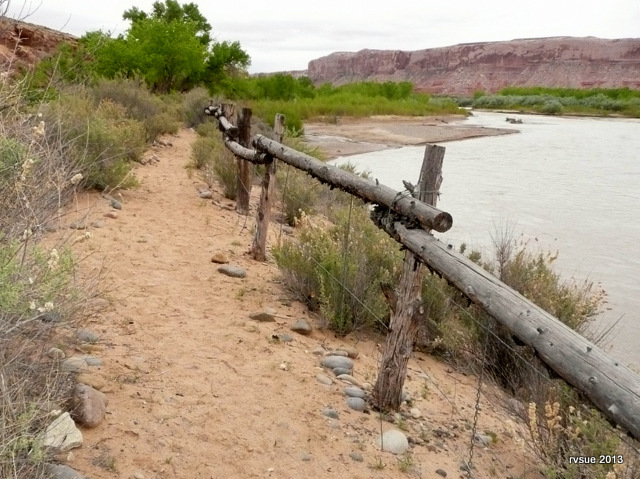 There is so much to see and do in southeastern Utah. Plan: Key lanyard. They are sold everywhere, and souvenir stands, too. Mickey Mouse lanyard, Grand Canyon lanyard. Frees up your hands for things like, well, dogs. Lanyard hangs on my front doorknob when I’m inside, around my neck when outside. I was only one in my bldg during Northridge Earthquake to tear out my front door with my my keys — that was a 6.8 product field test! I have the BLT keys on a lanyard which I consider essential when unlocking and locking the hitch lock and locking up the BLT when getting ready to hit the road. I usually keep the PTV key in my pocket or wear it on my wrist (the key “chain” is a bracelet.). I always take the keys out of the ignition and put them in my pocket before exiting the vehicle. No exceptions! Not even if I am just going to the mailbox a few steps away. That assures that the car is turned off, and that I can get back in! An extra key on a chain around your neck would be an alternative, but you would need to remember to put it on as you get dressed in the morning. And I, too, “always take the keys out of the ignition and put them in my pocket before exiting” the PTV. Why I didn’t this time, I do not know. I’ll bet I know what it was…. You had those blue corn pancakes on your mind..instead. I’ve been wanting to go out for breakfast. The Comb Ridge Cafe and blue corn pancakes are on the schedule!! Looks like a cute place. Great walk along the river. I always love hearing from Spike and Bridget. Glad you got your door opened so quickly!! Your lucky day! It was a situation of “unlucky” changing to “lucky” within a few minutes. Did San Juan Jim tell you the name of that apparatus he used to break in to your vehicle? It was probably a “slim Jim”. That way San Juan Jim could “jimmie” you locks with his “slim Jim”….glad it all worked out by Jimminy! A magnetic hiding key case is what you need. Cheap, easy, sold everywhere & they work. I have a big carbiner around here somewhere that I’m going to use to hide the key somewhere under the PTV. With the roads I travel on, I’d probably knock the magnetic case off and wouldn’t know I had until I needed the key. The wallet idea is a good one for men. My wallet is huge and stays in my purse which gets locked inside the PTV! One of the better ideas that Ford came up with was the keypad on the exterior of the door. As long as I can remember the number to punch in, I can get in the pickup. I always enjoy your blog. A very bright spot in my day! I’m glad you enjoy my blog, Don. Thanks for writing. wonderful positive attitude! The way you have chosen to live your life is spectacular! Dear E2 … You make me feel like a million bucks with your comment. Thank you! I like the idea of a magnetic key case but where to put it is the trouble. Under the hood is a nice place to put it but the latch to open the hood is on the dash inside my truck. If I put it under the truck it might get jarred loose by my 4 wheeling, or discovered by someone looking for the key in a magnetic case. Not long ago I watched a guy checking door locks at a Walmart parking lot to see if someone had forgotten to lock the door to their car. Luck was against this crook that day, because I called the police and allerted them to the crime in progress. Too bad I had to leave before the cops arrived. If the thief had a brain he would have looked for the magnetic key case ha. You write interesting comments, Joe. Hope you are keeping cool. Well, MIrta… When that plate of blue corn pancakes was placed in front of me, I picked up my fork instead of my camera. Living in the moment! Teach Spike,,,,,no Bridget,,,no,,,,Spike,,,,,,,,oh,,which ever,lol,,,,,,,to unlock the doors,,cool idea huh?. If I teach the crew how to unlock the doors, the way the locks work on the PTV, they would then know how to lock the doors. I don’t want to give them that kind of power! Maybe that’s how they got locked. One stray paw could (might) tap the lock button. This happened to me at home a few weeks ago. My dog was jumping up and down at the front door while I went outside. He hit the latch for the lock and locked the door! Fortunately, the back door was open. What a delightful day filled with nice people even if no internet signal or pic of the blue pancakes, which sound delish. May be time to make spare-key jewelry. I need to get some more spare keys. Sue, is it possible that one of the dogs stepped on the locks? (if they are power locks) My sisters dog has done that a couple of times As far as a spare key holder, I think they do make a combination lock compartment that goes into a hitch receiver that is made to hold valuables while away from your vehicle – but that won’t work when you are towing the trailer. I think Cabelas catalog was where we saw these. You may be right, Bonnie, about Bridget or Spike stepping on the door lock (probably Bridget). Interesting product — never heard of a hitch compartment. My internet must be wonky today, I looked up, I looked down, and I looked all around, but I could not find the picture of the Blue Pancakes! Do they even exist? Are they real? A blog about Blue Pancakes and NO PICTURES! What the heck is going on! If the Blue Pancakes are in the blog and we can’t see them, were they really there? Yes, Kevin, the pancakes were really there, but not long enough for a photo! Best wishes to you and your Bella. Nice to hear from you. You were giving me anxiety when I read you locked your keys in the PTV. Wow, were you lucky. I too wear my camper key around my neck when outside of the camper. I have OCD with 2 items. Keys and Umbrellas. ha ha ha… I too am wondering if blue pancakes exist because I’m not seeing any pictures. Just want you to know that I am still buying my stuff from Amazon using your link and still reading every post even though I don’t comment to them all. I appreciate you shopping Amazon through my links, Linda. No photos of the pancakes. Once they were placed in front of me my stomach was in control! The secret is Spike and Bridget… make a couple of spare keys to camper and van. Place each on Spike and Bridget’s collar. Let the dogs each have a set of key’s. Two things with this plan… 1) you won’t get locked out again unless you leave them in the van and forget the keys, but something tells me you always make sure you have the keys before shutting the van door when they are staying in the van. 2) the two keys will act like a bell (spikey I am thinking of your running around days) then you will always know when Spikey is headed out to inspect camps. Okay, the Blue Corn Pancakes. I never heard of these before… I am allergic to blueberries and anything in the food department that is blue makes me move 12 feet away. Wondering if they have blueberries in them? Ah, the mud puddle. Poor Spikey. I could feel his desire to lay down right there on the edge of that water as I saw the picture. OCD Rowdy has proved once again he can and he will cause problems. Yesterday, he took Gary’s water bottle out of his room to the back yard. The sport top is removed from the bottle. We find it in a few pieces around the yard. Rowdy sits and watches as we walk the yard with our heads down. Soon as we get close to a piece, he jumps and barks. Gary spent the rest of the day making door gates of cardboard to place across doorways to keep the dog out of rooms. Each door sent Rowdy running to me barking. Apparently, Rowdy knows he’s being restricted from rooms and was not all that pleased about the idea. He’s going to be two September 10th. Truly he is a terrible two stage dog. Kay . . . The pancakes are blue because they’re made with blue corn. I do loive happy endings and you seem to have a bunch of those. I was flabbergasted that a man with a lock kit shows up a couple of minutes after I lock the keys inside. Incredible! I am very bad with keys. In the ’80s, when I was fulltiming, I had a back up key on the outside of the camper and a key hanging around my neck. Right now, I have a house key, truck key, motorcycle key and motorhome key hanging on a chain around my neck. In two months, I hope that I will only have the motorhome key. Ah, the simple life symbolized by one key. Nice to hear from you, Lefty. 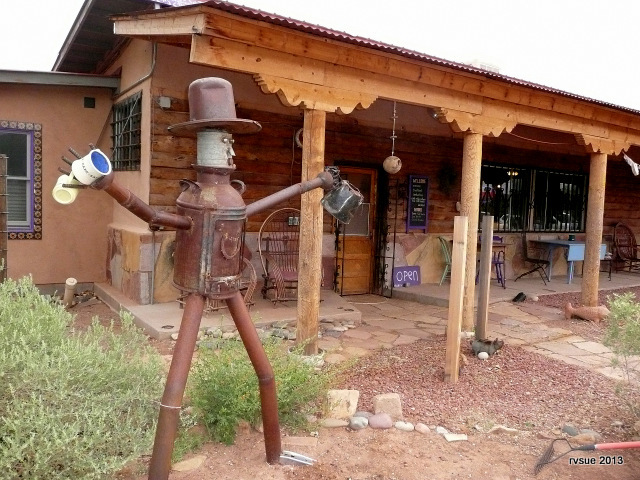 I ate at the Comb Ridge Cafe, right there on the front porch, a couple of years ago when I took a meandering adventure through Utah and Northern AZ. Your photos brought back memories of a very rich time in my life, even though I was in a period of major transition. Thanks for writing so consistently, Sue! Those who believe are taken care of by the Great Spirit. Hi Carl… Great to hear from you! Keys around the neck works for me….in my old age I’m so forgetful. One of these day’s I’m going to forget to put the keys around the neck…so far so good. Last night my daughter, my niece and her husband & I saw 20 or so closely spaced brilliant red/orange lights high in the western sky silently moving across the sky. We ran around trying to find our cameras but the lights flickered out one at a time until only two were left which we managed to capture on camera. Anyway, a police helicopter showed up and was trying to circle the lights but all the lights disappeared. The lights were too close to be planes and so many of them. Wow what a sight that way. Beautiful area you’re camping in…love to visit one day. What the heck were those lights? Very weird. Sue, I always feared locking myself out of vehicle, never have yet, (almost 60 years of driving). I used to hide a key by taping it somewhere in the wiring of the vehicle. When we travel I always carry 2 keys in my pocket, my wife will lock her purse in the car at times so no since having her a key. With these new vehicles I am paranoid about locking myself out. I always take key with me when exiting my vehicles, way I grew up. I once locked myself out of the RV… in Mazatlan. I had put the “second” key under the hood, but it was the key to my car back home… not the RV. (double duh…) It was a Ford and I had installed the keypad, but the battery was dead so the keypad wouldn’t work (it was always dead from day one, but Ford insisted that it was fine and it was all the electronics fault – finally put on a battery turn-off on it so that I could disconnect on parking for more than a couple days). My Chevy battery hasn’t gone dead once yet – knock on wood. The RV park manager in Maz had someone there in minutes with the right tool to open the door and it cost a pittance. Sue, locked my keys in the car last Sunday. No one around, spare keys, phone etc all locked in the car. By luck, I didn’t shut the drivers door all the way, just enough to latch it almost fully closed. Put the grey matter to work and grabbed a garden vine climbing post thing, pulled on the car door corner enough to wedge the post into and onto the door lock, and pushed to lock until the door unlocked. Now I’m going after those chains that soldiers carry their dog tags on. Well, Mark, I think some things, like blue pancakes, should be first seen in person. I want you to experience for yourself the anticipation, the wonder, and the sensory delight of your first plate of blue pancakes hot off the grill. OK….. Chuck and I are getting blue pancakes tomorrow morning! hahaha! Last year my dogs locked me out. It was a very hot Phoenix summer afternoon — about 112 or so. I was returning my RV to my storage facility after a trip and thought I would leave the engine running with AC on so my two dogs could be comfortable while I pulled my car out of the spot where the RV goes. You know it — the dogs jumped up to the window to watch me and hit the door lock with their paws. Luckily I had left one of the windows cracked, so i was able to McGyver it — I made a little lever out of a couple wrenches, duct tape and wire ties that were in my car, lowered it through the opening in the window, and bumped the lock button to “open”. The funniest thing was how the two dogs were perched so nicely (and comfortabley) on the driver and passenger seats while I was struggling and sweating in the heat. I swear they were smiling :-). From that day, I have a spare key around my neck and never, ever leave the engine running when I step out. You surely have been born under the ‘lucky’ star!!! Glad it turned out so well!!! What do blue-corn pancakes taste like?? We’ve eaten blue tortillas before and they taste just like white or yellow tortillas… Poor ol’ Spikey, mama won’t let him play in a pud-muddle and it looks like a really gooey one!!! I’m asittin’ on the RunningStar Ranch in Coleman county TEXAS, where all RVrs are welcome to stop, do a little chin-waggin and sip up a cup of Joyce’s great coffee!!!! Butterbean! So good to see you here again. I missed you. To tell the truth, blue corn pancakes aren’t that much different (to my tastebuds) than white pancakes. They do have an occasional slight crunch. Joyce & I ‘had'(RIP) the smartest Shetland sheep-dog, Lady Shelbourne(Shelby), in the whole state of RunningStar Ranch; she would obey all kinds of commands… Joyce pulled her Explorer up to the barn, went inside for a minute, came right back out & Shelby had locked the doors, with the motor running!!! Like I said, Shelby would understand and obey MANY TYPES OF COMMANDS, but she didn’t know OPEN THE DOOR!!! An hour later(we live in the middle of nowhere) and $50, Joyce got the door opened, while Shelby looked on, but she never learned the command OPEN THE DOOR!!! Maybe it’s just as well Shelby didn’t learn “open the door.” Then she might’ve figured how to work the lock and thought it funny to lock you out, especially if miffed about something. I’m glad it all worked out. You just never know where the next good person will come from…but they’re all over the place. And yes, if I ever get to go down the river they will be the first I call! Would be a terrific trip! If you like seven days of camping in a group, as well as the river float, then it would be terrific. I don’t think I’d like it, even as much as I like being on the water. I have a little backpack purse I always wear shopping. No one else wears them anymore but who cares, it keeps my wallet and keys safe. Always upon exiting my vehicle or even before, the keys go into the backpack and onto my back for safe keeping, zippered up. I have to admit though about a month ago on a Sunday, it was a very cold and windy day and I was off to a sale. Upon exiting my vehicle the wind was whipping in the cold air and my keys apparently did not reach my backpack purse and were deposited in the parking lot next to my vehicle, unknown to me of course. After shopping and exiting the store, I start digging for my keys, they are not there. In a panic, I go back to the store, no they don’t have them either. Finally, trying to conceal my panic and keep a cool head, I start walking back to my vehicle and the closer I got, I saw something shiny and blue on the ground next to my vehicle. Yep, there they were just waiting for me to come back. Whew, a close call with total calamity. I always think I am cognizant of things like credit cards and keys but this little incident made me realize there is always room for error. Hope I did not bore you with this story but just repeating it is another reminder for me how you can never be too careful. Hi Virginia… Glad that all worked out fine for you. I think it’s the times when I’m going to get out of the PTV “for just a second” like dump trash in a bin that I’m most likely to forget to take out my key. Glad you finally got your blue pancakes. Was it real maple syrup? Having grown up in NY state and living in New England, I just can’t eat the fake stuff. Everyone seems to have a story about keys locked in the car. Aggravating how we can be so careful but there’s there one momentary, tiny, little lapse. I’m so glad that someone was around to help you so quickly. As a native New Yorker, I like the real stuff, too. I believe this was. To tell the truth, I don’t know. It was served in a tiny pitcher. You didn’t do anything we haven’t all done. I’ll tell you how I fixed the problem. I tried the magnetic key holder but it either got knocked off or vibrated off so, I took a stiff piece of wire put just my door key on it and wired it to a place on the frame behind my license plate in front. Never needed it again but when I sold the vehicle, I showed it to the new owner so he could use it if needed. Live and learn they say….Heating up here….Best to ya Sue and crew…. I’m going to wire a key to the frame. I don’t trust those magnetic thingies, especially when I drive over rough roads. Haven’t we all ——- been locked out one or more times from home, rv or auto? I have lots of times. Can’t seem to learn any better. Now – why do the manufacturers put those locks where dogs can so easily stand on the lock button? Seems a small child could lock them unknowingly as well. Last vehicle I bought I insisted on NO electric door locks. The salesman thought I was crazy. 40 or so years ago I worked at a company that used a post office box for mail delivery. My son was in day care – since the post office was on the way to day care, we got the mail first and my son would usually wait in the car. (This was a very small town, and a long time ago, things were very different then. Wouldn’t do this in today’s world!) One cold winter morning I left the car running with the heater on so my son would be warm. As I was getting the mail out of the box, I looked down and my son was standing there. He said, “I just wanted to come in today, mom, but don’t worry. I locked the car!” A quarter of a tank of gas later, a policeman got the door open – no charge! Amusing story, Sue ….. but I’m glad it worked out so neatly, or it wouldn’t have been so amusing! We got locked INSIDE our vintage 1953 Terry Rambler Travel Trailer one night at a county campground and, even though we were camping with friends, it was 2 or 3 in the A.M. (had woken up to make a trek to the WC) & the cell phones weren’t getting a signal! Luckily, we had one rear window with the screen detached from the frame & my husband had to dangle backwards out that window and unlock the trailer with the key from the outside! I’m sure it must’ve been quite a picture! If you ever get desperate enough to break a window, the windshield is the cheapest and easiest to have replaced. Most people think to break a side window, but that’s not the best choice.